In 2012 the Hooters Master Card was replaced by the Hooters Visa Card. Recently Hooters Master Card program has been totally discontinued until further notice. The material written below is kept only for the historical purposes. Stay tuned if Hooters decides to renew their credit card program. Hooters Master Card makes redeeming your points automatic. “Opt In” to the recurring Hooters Card Gift Card Program today and check your mailbox every month to see your reward points build up like magic. 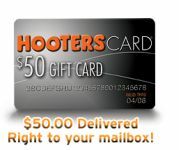 Whenever you reach 5,000 Points, Hooters will send you a $50 gift card that’s as good as cash at your local Hooters. No hassles, no gimmicks. It’s just that simple. Please allow 8 weeks to receive your card.